Giant, Trek and Specialized, the big 3 of bicycle brands make up 80% of the market. 95% of these bikes are built in China or Taiwan. Not Goodspeed. 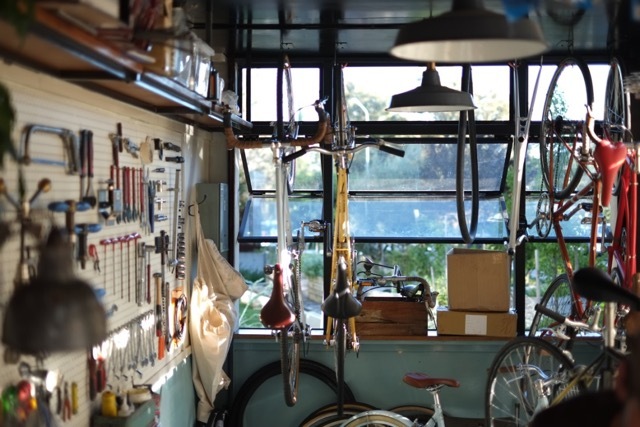 Today Canberra’s own Goodspeed Bicycle Co. designs and builds bicycles in Canberra. The bike shed from which Goodspeed operates was only completed in 2015 and I can say the guys at Goodspeed run a pretty cool shed. Before this, however, they had to deal with the dilemma of opportunity or distraction. This dilemma was 13-square metres of empty space at New Acton. When a group of friends got together and said hey, it’s hard to find a place where we can get on our bikes and share some time. When this message keeps repeating itself, consistently, over and over, it is likely there is something missing. So they created Mocan and Green Grout, a simple 13-square metre espresso bar. What happened at Mocan and Green Grout was simply astounding. Mocan and Green Grout tripled in size. Growing from being a corner espresso bar to a full-service café during the day and restaurant at night. Opportunity or distraction is one of the hardest business issues to deal with. What drove the guys at Goodspeed to conclude a café was an opportunity was the fact it brought them closer to their goal. A goal of creating a new experience in a new precinct, New Acton, driving a cultural change. One of the key figures, Myles, recounts how his extensive plans to manufacture steel bikes was temporarily put aside by the opportunity to create a new café experience in the New Acton precinct. Coming from a design background, Myles just wanted to create something amazing. This goes for everything Myles applies himself to. As Myles says, you must put your soul into your idea and business, because if you do it for the money, it’s hollow and when the money runs out you are left with nothing. Myles challenged himself to manufacture bikes in Canberra as good as any other on the market and at a better price. He was told it couldn’t be done. But through efficiency and good design, he did just that. If a tool didn’t exist, he would build it. He would hunt down the right paint, the good steel and invest hours in getting all these components to come together. With an industrial design background, Myles teaches us another lesson to your strengths. Goodspeed found an instant following. No advertising and no website. The Goodspeed bikes were simply parked at Mocan and Green Grout. Mocan and Green Grout was the vehicle which created a new experience in a new precinct, driving cultural change. This story is about passion and persistence; sheer determination inspiring others. It’s this inspiration that allows a business to have a life of its own. So yes, you can manufacture a bike in Canberra as good as the best in the world and for a great price.